In Command is a stallion of legend. 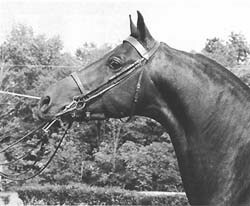 No other horse, except perhaps his great sire Waseeka's Nocturne, is so prominent in the pedigrees of morgans in this century. 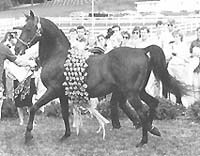 An ungainly colt in youth, he matured into a spectacular stud and was The Horse to Beat in the showring. 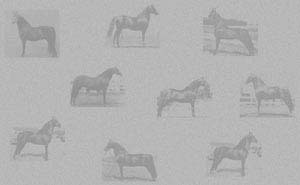 Yet his disposition and manners were kind enough that he was also shown in the Amateur division. 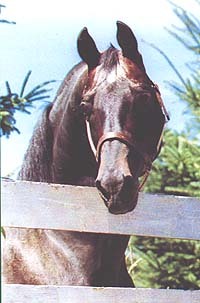 In Command was a prepotent sire and he founded a dynasty. His bloodline has dominated the modern showring like no other has ever done. 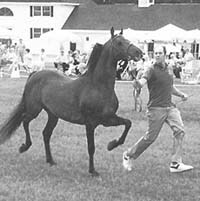 He sired 164 foals: Tug Hill Commando, I Will Command, Carlyle Command, Troutbrook Hallmark, Wham Bam Command, Honor Command, Deer Run Command, Fiddler's Cash Command ...these are but a tiny sample of his famous get. His sons rival their illustrious father as sires themselves: Noble Command produced Valiant Tony, Nobility and Noble Flaire while Wham Bam Command sired Century Free Spirit, Hyland Acres Command and Careless Whisper. 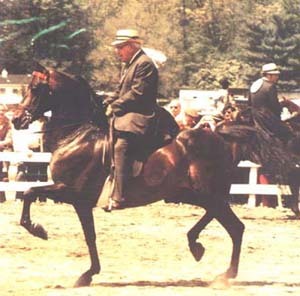 Despite his passing, In Command's impact on the morgan breed continues to grow.